We’re excited to share that Knowify has been selected to participate in the inaugural UrbanTech program run by DreamIt, one of the top startup accelerators in the world. At the center of the program is a major, multi-billion-dollar construction project in Tampa Bay: the revitalization of the Tampa Bay waterfront. Over the next several years, you will see new office towers, apartments, infrastructure, and public facilities, and a vibrant new district will emerge when now underutilized space and buildings exist. Your can learn more about this project here. The entire project has embraced technology from the get-go, from the use of advanced green materials, to Sim-City like technologies that help planners visualize pedestrian and traffic flows. The waterfront revitalization project is turning into much more than a construction project – it’s a glimpse into the future of how cities will be built, managed, and sustained. For our part, we will be working closely with the large GCs on the project to try to bring our powerful tools to their subcontractors, with the aim of improving GC/Sub communication and reducing the administrative burden subs face on the job. Thank you DreamIt for the opportunity! See you all in Tampa! The new smartphone App Is here! Over the last few years we’ve been collecting a bunch of feedback and suggestions from the Knowify community and we wanted to make sure the new version meets all your expectations. We know how conditions in the job site are not always ideal and our main goal was to make the app as resilient as possible. After more than a year of work, the new app translates all this feedback into a powerful tool to track your jobs and collaborate with your crews. 1. Both online and offline: The app will work even when the user has no internet connection. The only times when it’s required to have internet connection is the very first time the user opens the app or when any data has to be sent to the office. By providing this enhanced offline experience, it will be easier to get your crews set up: meet with them in the office when they get started with Knowify, make sure they can all login, and they should be fine from that point on. 2. Even easier-to-use interface: We have improved the navigation and the menus to simplify the experience. The new app is faster and much easier to use. 3. Fewer user mistakes: We’ve all forgotten at some point to check out once we leave the job site. Now, the app will notify you and you will be able to check out from whatever you are and adjust the time. We’ve also improved the check out experience, giving the user the option to adjust the time and provide a reason for that. Any time entry that is manually adjusted by the user will be flagged as such, providing the office an opportunity to check the changes. This is ideal for cases where the user forgot to check out or took a break. 4. In English or Spanish: Hola Knowify! We finally have a version in Spanish to make your crews work even easier. Each user will be able to choose their language within the app. 5. Better communication between the office and the job site: Let your crews in the field report deficiencies, safety issues or general comments and keep everyone in the loop. Also, manage images (including bulk uploads) and share documents with the office. 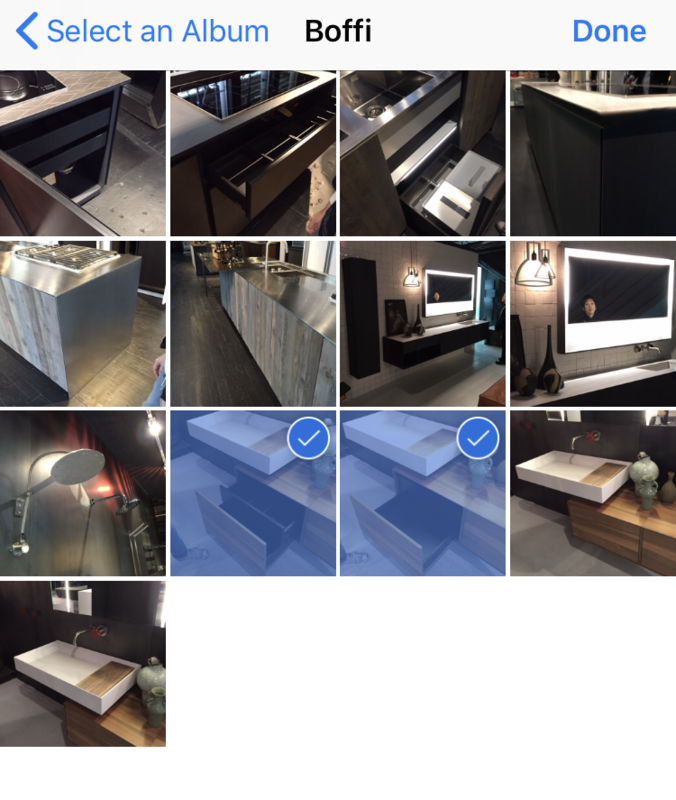 This new app has many enhancements, all of them aiming at making your contracting business more efficient . Allocate materials from the field, report safety issues, manage your crews, enhanced communications, and more. If you wish to learn more check out this video tutorial. 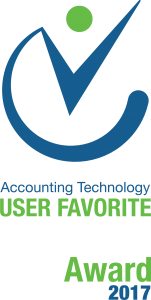 We are thrilled to receive the 2017 User Favorite Award to the best industry-specific solution! Accountex USA is the leading independent conference on accounting technology and showcases companies that provide the most productive and effective technologies and meet the highest standards of design, ease-of- use, and conformance with appropriate accounting standards. Thousands of users voted during the conference and these were the other honorees along with Knowify: QuickBooks, Sageworks, Salesforce, Right Networks, Handifox, Expensify, ADP, Scanov, Karbon, Asana, Bill.com, TSheets, Fundbox, SmartVault, Oracle, Intuit Field Service Management, LedgerSync, Tax1099, Chargeover, ProSeries, CCH Wolters Kluwer, Square, QuickBooks POS, B2B Gateway, Fiscal Technologies and Zapier. According to the Accountex committee, the award “honors the solutions that have the happiest clients. It creates a true user satisfaction award rather than a popularity contest”, and nothing makes use happy than an award voted by the users! Congratulations to the entire Knowify family for the hard work and special thanks to our network of Advisors and Construction Company Advisor Network members for their support! As you already know, we won’t stop here. We have many surprises in the pipeline, including a couple of integrations with new partners that will make running a contracting office even more efficient. Another exciting new release of Knowify is here! Our mission to modernize the contracting office continues! 1. New job logs section: In order to improve your visibility and control over your jobs, we have created a new section that will display chronological job logs. This new section will merge user actions, comments, documents and emails to capture the whole job history, giving you the ability to see and analyze how the job has evolved. No better way to stay on top of your jobs than by having the full job history. Along with this new section, we’ve added the ability to capture the email correspondence around your Knowify-generated proposals, change order, invoices, and more. This feature adds a unique ID to all your email subjects, which will allow Knowify to retrieve the emails and display them in the job log. If you wish to enable this feature, contact support@knowify.com. 2. Improved scheduling: This new release includes significant changes in the way you can schedule in Knowify. We’ve been collecting feedback over the last year, and we feel the new changes will translate that feedback into a smoother experience around scheduling. 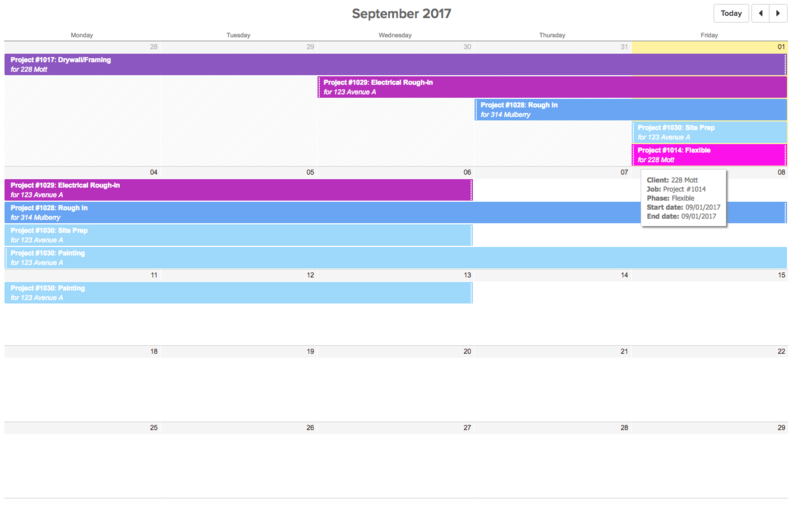 For starters, the Corporate Calendar will be the default view in the scheduling section, and you will be able to schedule and make changes in the Corporate Calendar itself. Also, we have adjusted the look and feel of Job Board to display more information when scheduling your crews. Last but not least, scheduling dates in Plan and Track is back. You will be able to set dates or just go to Job Board if you also need to schedule your crews. 3. Improved management of time and materials jobs: While our support for T&M jobs was already very solid, we’ve strengthened certain areas around recording bills against POs, editing POs, and other edge cases. 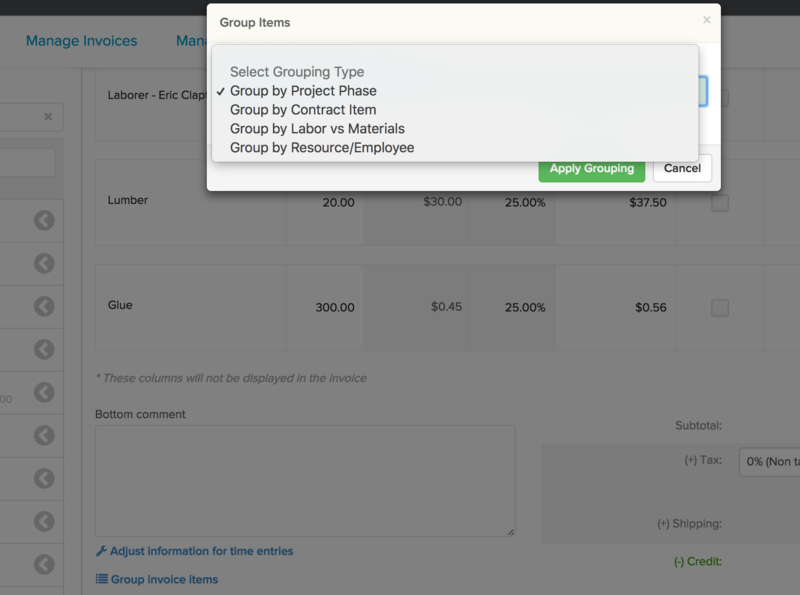 Also, when invoicing your clients, we have created a new feature that will help you easily group your invoice items based on certain parameters, like labor vs materials, job phases, etc. 4. New form for purchases: We have improved the user experience around creating POs and expenses. The most relevant change is the ability to allocate items to multiple jobs within the same PO or expense. 5. Setting budgets in Simple and Advanced job costing modes: The popularity of our Simple and Advanced modes has grown so much that many of you have been requesting the ability to set cost budgets once the contract is approved. Now you can do it. Just go to the Plan and Track section and set materials, labor and subs budgets. 7. More powerful import of data from QuickBooks: We have added support to capture expense items with negative values and expenses against multiple jobs. We have also improved the logic behind the QuickBooks import to prevent duplicates and errors. 8. Hide/display contract breakdowns in customer outputs: Many of you have been using the BOM/breakdown feature in Contracts to come up with your bid values. However, you didn’t want to display the breakdown to the customer. Now, you have the ability to show/hide these values in the contract. 9. Service ticket history page: This page will look the same, but it should be working much smoother than before. We’ve changed the technology behind it to speed it up, which will be really convenient for those of you with many service jobs. 10. Advanced e-signature features: If you are using our e-signature features, now you will be able to prevent Knowify from attache the proposal pdf to the email (in case you want to force your customer to click on the e-signature link) or produce an e-signature link without sending any email (in case you prefer to use your our email to send the link, outside Knowify). 11. Improved exports of vendors and bills. 12. Improved display of information in Work Order outputs. 13. Editing job names will sync with QuickBooks Online. 14. Improvements in Pay Apps, like the ability to set retainage with decimals or invoice in full after just having invoiced for stored materials. 15. US companies can enable/disable taxes in purchases. 16. For non-US companies, we have improved the tax support in expenses and bills and now you can exclude certain tax rates from job costing calculations. 17. Complex tax codes in non-US companies will now be broken down into their individual rates in contract and invoice outputs. 18. 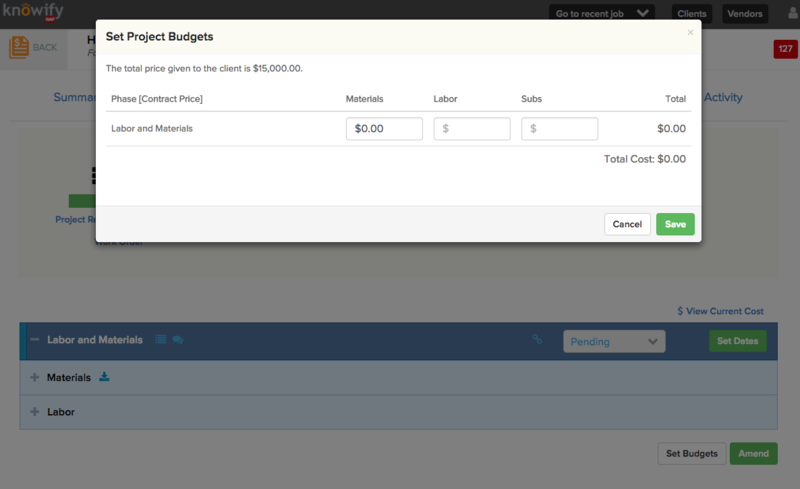 Ability to add a contract summary page to your invoices to help your customer understand your progress billing. Contract support@knowify.com to enable this feature. 19. 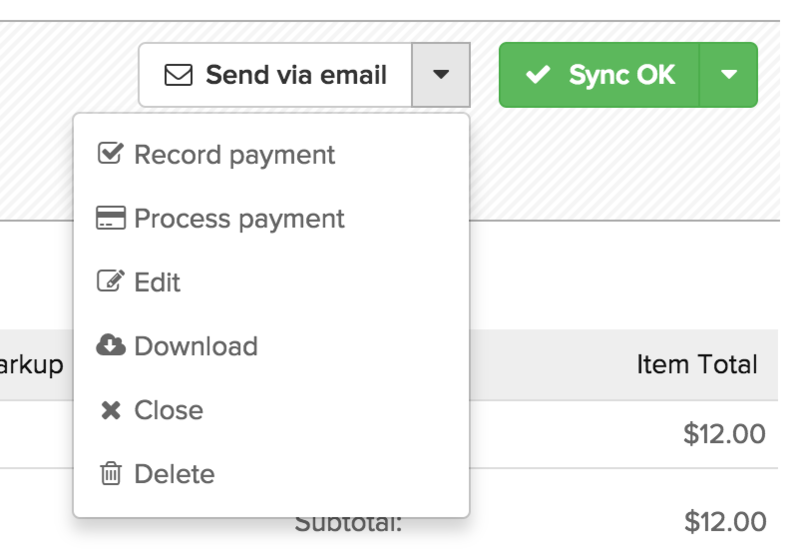 Ability to disable the recording of payments when using PaySimple. This will avoid duplicate payments in QuickBooks if you pul data from your bank feed. For those of you interested in learning more about QuickBooks Online, click here. Stayed tuned, because we have more enhancements in the immediate pipeline. In the meantime, do not hesitate to reach out if you have any questions. 3D printing has emerged as a powerful tool across a wide variety of industries and applications. You might have thought that buildings were on a totally different scale though, and immune to the disruptive potential of 3D printing. Think again! Although 3D printing an entire building from start to finish may seem like science fiction, the truth is that we’re much closer than you think – thanks to Cazza, a Silicon Valley startup. Cazza is developing a 3D printing technology specifically for construction. They’ve already demonstrated proof-of-concept with low-rise buildings, and they’re currently working on enhancements that would enable high-rise construction as well. Could 3D printing dramatically reshape construction into a far less labor-intensive field? Stay-tuned! 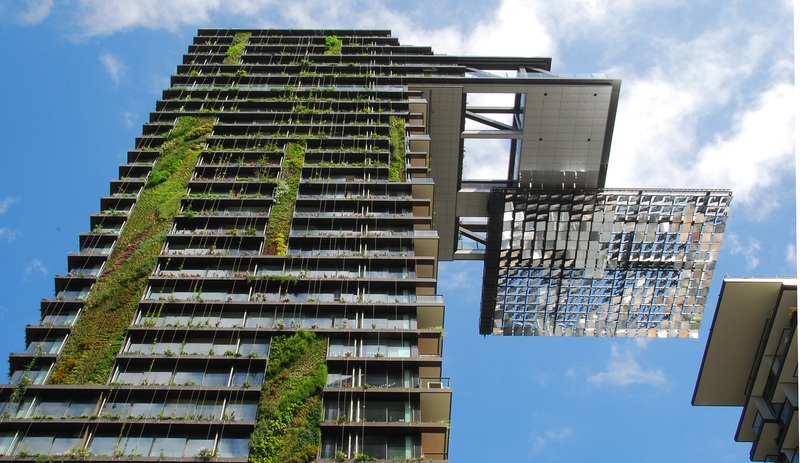 In an effort to reduce the ecological footprint of buildings – from construction materials that end up in landfills to inefficient buildings that waste electricity and water – builders have begun turning to emerging “green” technologies. Some examples include: (a) natural paints and mycelium bricks (look it up… very cool!) 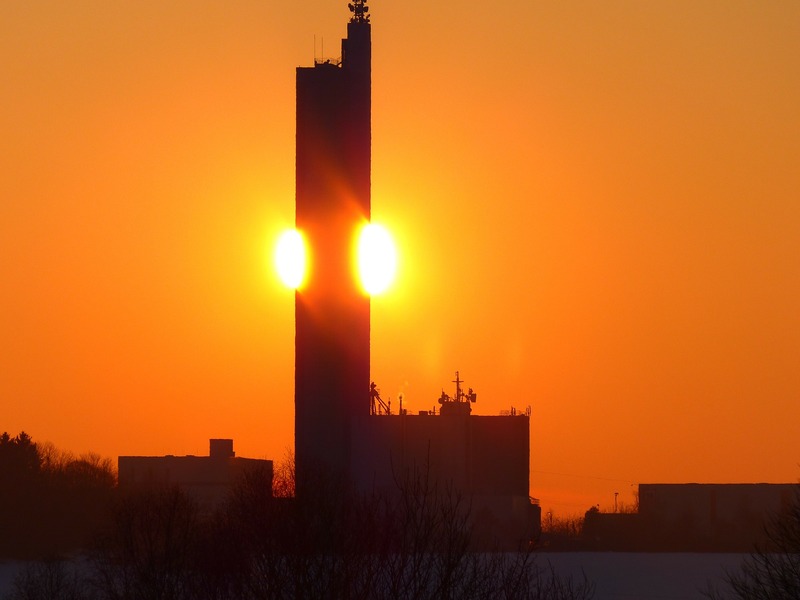 that decompose and do not emit toxins; (b) smart (electrochromic) glass, which uses ions to reflect UV rays during peak hours over the summer and dramatically increase the energy efficiency of a building; (c) and active solar panels that absorb UV rays during the colder months and warm the building’s interior. As construction methods change and become more efficient, we will likely see more and more companies integrate sustainable materials into standard practice. Unmanned Aerial Vehicles (UAVs), also known as drones, have traditionally been used to survey areas with limited accessibility. Drones not only eliminate the need to rent expensive lifts or other such equipment but also offer efficiency and accuracy gains over human teams. Drone surveys can be compiled into 3D models to compare progress vs. the architectural plans, helping to give superintendents, project managers, and owners a better grasp of job status. No less important, drones improve job site safety. Falls make up the largest percentage of construction-related fatalities in the United States; with drones, construction firms now have the ability to look at hard-to-reach areas without risking the well being of one of their employees. With smart watches and bluetooth earbuds becoming the norm, it’s clear that wearable technology is here to stay. The construction industry could be a huge beneficiary of the emerging “Internet of Things” (IoT) movement, given the value of real-time updates and seamless communication between the field and the office. Safety appears to be leading the way: already some companies have begun deploying smart vests, which not only have an emergency button and use GPS to locate workers but also have built-in heart monitors to help PMs and foreman track the stress levels of their team members. On the other end of the spectrum, exoskeletons being built by startups like Ekso Bionics offer construction workers the promise of superhuman strength. In an ideal world, every member of your team, in the office and on the field, should know the project’s end goal and be able to visualize it. With augmented reality and virtual reality, this dream may yet come true. So what’s the difference between VR and AR? Virtual reality completely replaces what you can see with something else: if you put on VR goggles, your entire environment changes. Augmented reality, on the other hand, takes something virtual and transposes it to the real world. VR can be very useful in project planning from the start, while AR technology can project 3D images directly on the job site to measure building materials and ensure the design is built exactly as intended. With the potential to significantly reduce error and increase efficiency, AR and VR have a bright future ahead of them in construction. The first step in taking advantage of construction technology is switching to a cloud-based software so everyone is kept in the loop. The cloud isn’t new to construction tech trends, but now more than ever it is essential to any project management. The ability to share information and track profits in real time is a powerful tool that enables everyone stays updated immediately. No more worrying that your computer will crash and all your data will be lost. With cloud-based software, data is constantly backed up and always accessible no matter where you are or what happened to your computer. Of course, with new technology, comes new rules and regulations. Before much of this can be implemented into your daily routine, there is still extensive testing to be done in order to ensure the safety of everyone on the job site. However, as we begin a long journey of technological change, it seems we’ve only scratched the surface of the future of construction. Welcome to Knowify! We’re thrilled you’ve started your trial and we hope you can take some time to explore our features and get comfortable with the software. Here are some great ways to make the most out of your first two weeks. Experts say it takes about 2 months to form a new habit. When it comes to implementing new technology into the workplace, it may take even longer to get your teams used to a change in routine. Although there are many benefits to construction software – real time project updates, easily accessible and readily available documents, and boosted efficiency to name a few – the construction world is sometimes stuck in a “this is how we’ve been doing it for years” mentality. With new technology comes constant change; with that being said, here are some ways to give your team the extra nudge toward enactment. Our new release is out! Get ready for a long list of new features and improvements, including some of the most requested features in Knowify history. 1. Create clients, vendors, and catalog items on the fly: Our search bars will now let you create and save new clients and vendors when you need to. Also, and more importantly, they will give you the option to create products and services without having to go to the catalog section. Quick and easy. 2. Company documents: The admin section has a new tab called ‘Documents’, where you can store up to 20 company documents. We’ll make these documents available every time you are about to send an email to a customer or vendor, this way you can easily attach them. You can use this feature to store your insurance documents, general information about your business, or any other information applicable across jobs. 3. Overtime: Yes, it finally happened. Over the last months we’ve received many requests to extend our overtime capabilities. However, as many of you know, QuickBooks Online has not released support for overtime and we’ve been waiting for them to make sure our features would seamlessly fit into their structure. 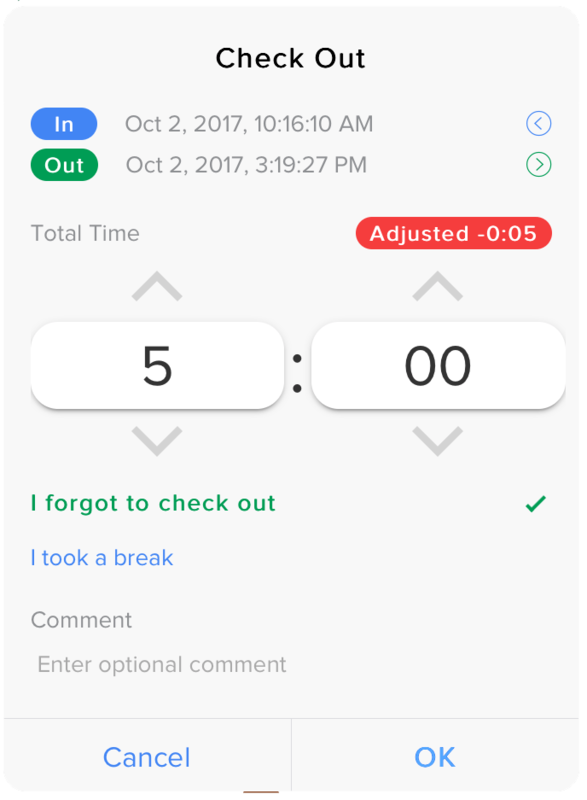 Well, we didn’t want to wait any longer so we’ve released our enhancements that will give you more control over overtime. For now, these enhancements will be available upon invitation. If you are interested, reach out to support@knowify.com. 4. 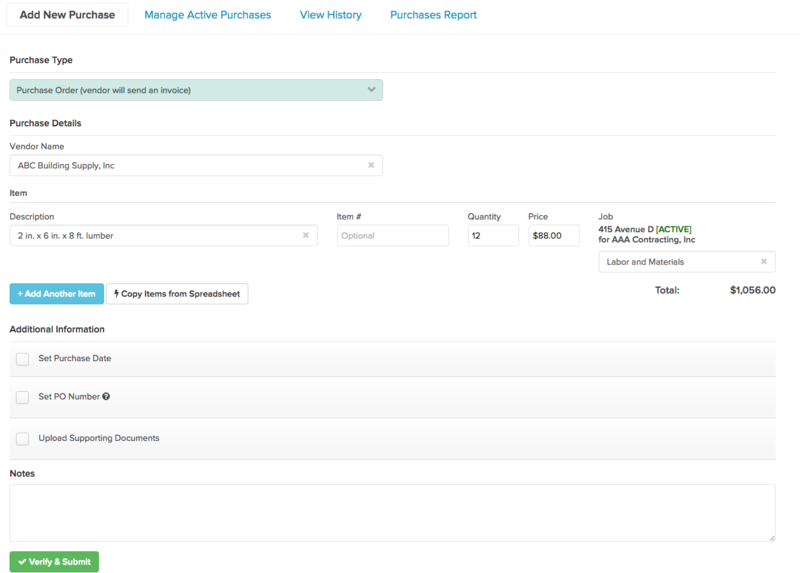 Attachments in purchase orders: Now you can attach additional documents to purchase orders. Along with this change, we’ve also improved our support for vendors, allowing them to store multiple contacts. These contacts will also be available when you send POs via email. 5. Additional comment in e-signature: When your customers e-signed a document, now they will also be able to provide an optional comment. This comment will not modify the content of the agreement (as clearly states the e-signature page), but will streamline the process of managing classic follow up questions from your customer like when the job starts or when the deposit payment can be expected. This comment will be included in the confirmation email and will pop up in your dashboard activity. 6. Subcontractor PO workflow: We’ve improved the workflow related to managing subcontractors in Plan & Track. 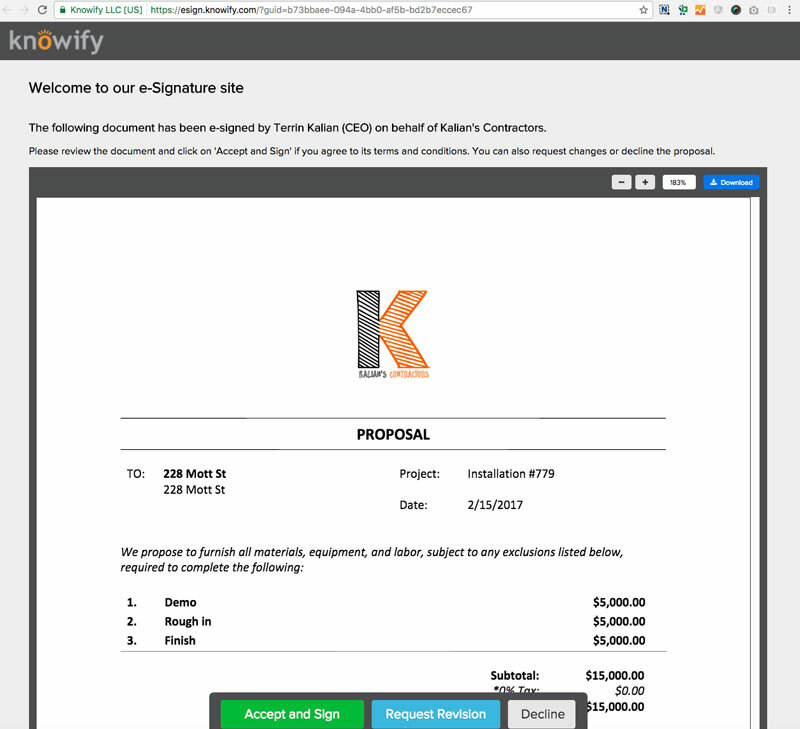 Now, when you select a subcontractor and Knowify creates a subcontract PO, this PO will include the work order information. 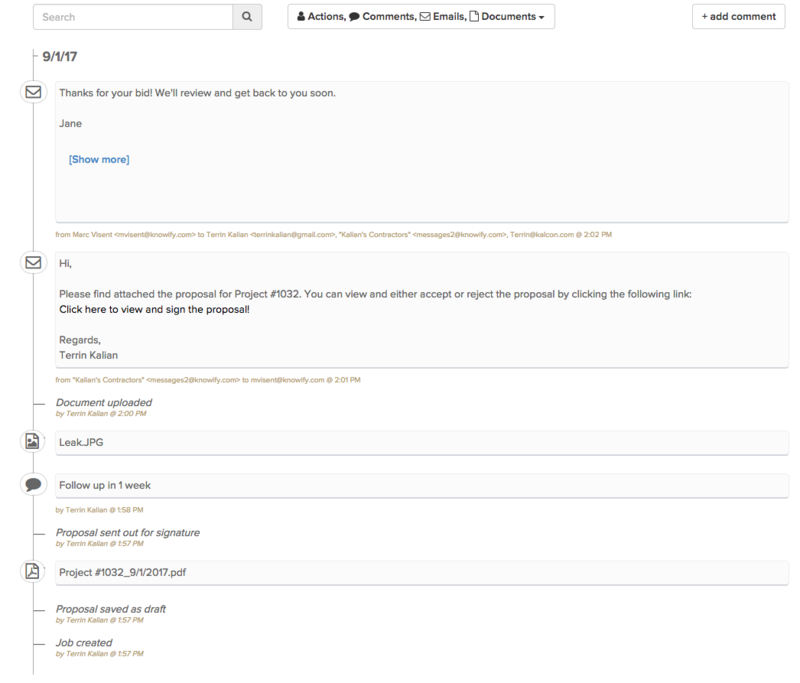 Also, the subcontract PO document can now be customized, giving you the ability to include useful information (whether scope of work, terms and conditions, payment details, etc) for your subs. 7. Custom placement of e-payment link: For those processing electronic payments, you can now place the payment link anywhere in the email you sent to the customer, so it doesn’t need to be at the bottom any longer. This gives you the flexibility you need to customize your emails and will likely improve the customer experience. 8. New actions panel in detail pages: Many of you already had access to our newest action panels, but now it’s available to all users. These changes make a lot easier to understand all the available actions in the detail pages of purchases, bills, and invoices. 9. Email attachments: We’ve improved the experience around attaching documents to emails. We’ve increased the attachment area, and we’ve made it easier to verify that your list of attached documents/files is correct before sending the email. Also, we’ve made it very easy to attach standard company documents (uploaded in the admin panel – standard examples include W9s, licenses, etc) to any email. 10. Contract summary report:We have a new report available when you send a change order to the customer for e-signature. This is an optional report with the contract summary that will be attached to the confirmation email once the change order is signed. This is a great way to make sure you and your customers are on the same page regarding the status of the contract. We know things can get a bit hairy when multiple change orders are out for signature. 11. Manage users: We’ve completely changed the section to manage users in the admin page to make adding, updating, and removing users much easier. 12. Manage equipment:Similarly to users, we’ve adjusted the layout of the section to manage equipment to make it more user friendly. 13. Speed improvements: There are significant improvements in Manage Bills and Manage Service Jobs sections to make them a lot faster. 14. 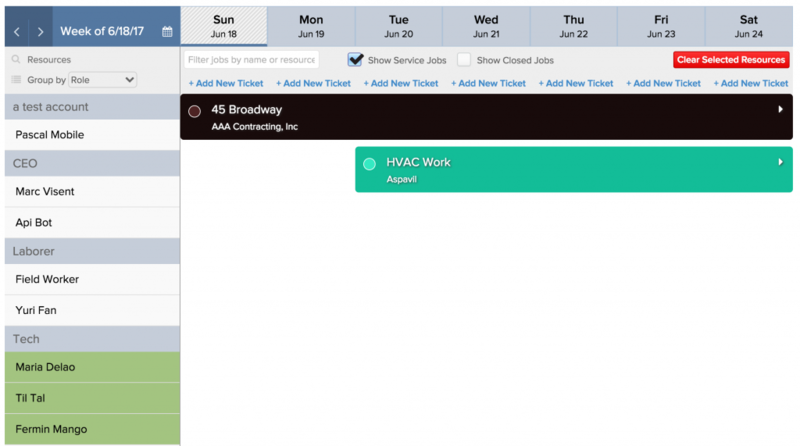 Job board: We’ve enhanced Job Board to include new features like Add New Allocation for job scheduling, group scheduling, and the ability to create service tickets on the fly. We’ve also improved this page to remember your latest settings when you go back to it. 15. Multiple vendor contacts: We’ve mentioned it before when we were talking about attachments in POs, but now you can also create multiple contacts for each vendor in the Vendors section. 16. Unit-based billing in owner contracts: We’ll keep adding invoicing methods to the platform and the newest addition is unit-based billing in owner contracts. If you use catalog items in the proposal and set quantities, you’ll have to option to invoicing your customer based on these quantities. 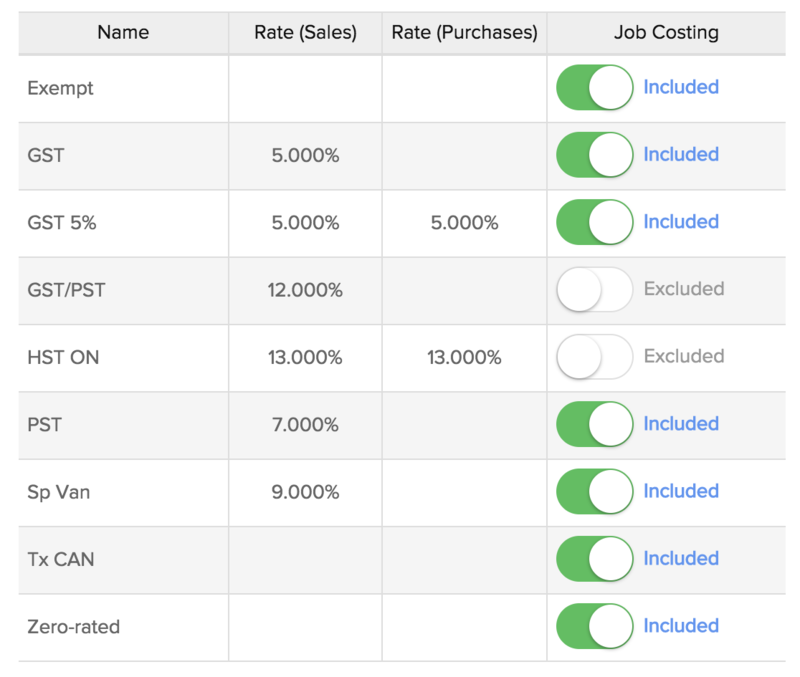 Unit-based AIA-style billing will come in our next release. 18. Holdback in owner contracts (non-US): For our international users, we’ve improved our support for holdback in owner contracts. 19. Clockshark import: We’ll be focusing on integrating with other useful apps in the near feature and our first step is a simple time import for Clockshark users. Contact support@knowify.com for more information. 20. User logs in contracts: In order to speed up the contract page for those dealing with large amounts of items, we’ve hidden the list of user actions by default. 21. RFIs: RFIs will now display the title of the RFI inside the pdf document. 22. Improvements in electronic payments: This release incluedes a few improvements in our PaySimple integration, such as a better handling of ‘Do not honor’ errors, email confirmation for payments processed in the office, and better information in the action logs. 23. Client notes: You can now include custom notes in the client page. We’ll be extending the capabilities of this future soon. 24. Job name restrictions: For those connected to QuickBooks Online, we’ll be enforcing a 50-character limitation in job names to prevent sync issues. We will also prevent users from including ‘;’ in the name. 26. Job colors: Along with the current option to select a job color, we’ve included a list of predefined colors to make the color selection easier. 27. QuickBooks improvements: Our QuickBooks sync will be taking client tax rates and notes from QuickBooks into Knowify. These properties will sync both ways soon. We’ve also improved the experience around identifying sync errors. 28. Smartphone app improvements: We’ve made a few small adjustments to the smartphone app to make it more reliable. One of these improvements should fix the check in/out issue that some users have experienced in UTC-8. UTC-9 and UTC-10 timezones. 29. Opportunity value and profit information for leads: We’ll be making significant improvements to lead management in Knowify, enhancing all our CRM capabilities. The first step is displaying the opportunity and profit values for leads in Manage Contract Jobs. 30. 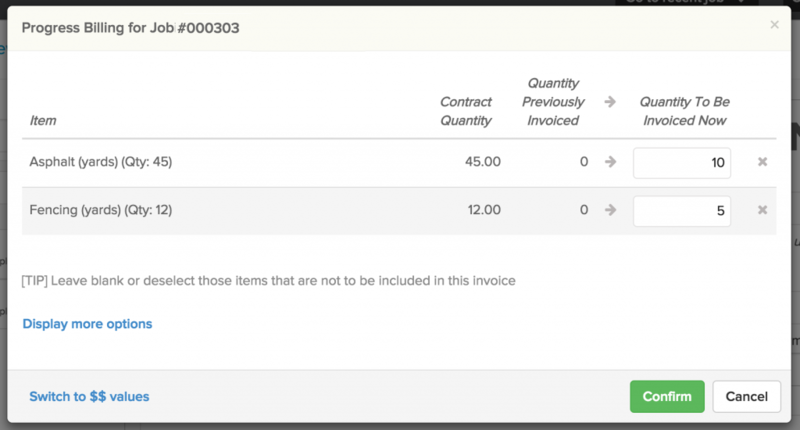 Adjust cost and markup for time entries in the invoice: When invoicing billable items originated from time entries, now you can adjust the markup in the invoice. 31. Actions around review time: We´ve duplicated the actions at the top of the table of Review Time. This will be especially handy for those managing many entries at the same time. 32. 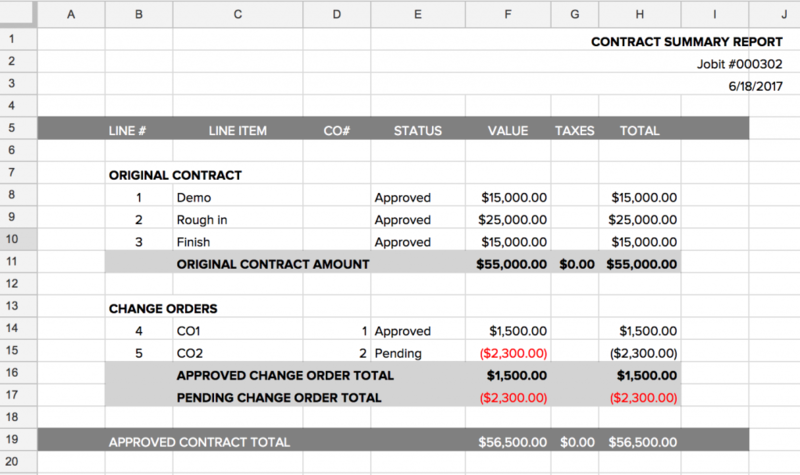 Update contract breakdown based on budget changes: For those going back and forth between Plan&Track and Contract in the budgeting/bidding phase, you’ll have now the option to update the breakdown of materials based on changes in the list of materials of the project plan. By now you are probably familiar with our e-signature tools. They allow you to email your proposals and changes orders to your customers so that they can view and sign them. This is one of our most popular features and it really shows your customers a level of professionalism that can set you apart from your competitors. However, the e-signature tool is not just a cool marketing feature: getting these documents signed will protect your business and improve your relationships with your customers. At Knowify, we believe that a clear and transparent signature process is essential for any contracting business. It helps that one of our founders is a former attorney that in his previous life had to deal with multiple disputes around contracts. With that experience in mind, we designed the contract management tools in Knowify that will help you build safer and more reliable business relationships with your customers. Professionalism: You start the relationship with your customer on the right foot. If you level of organization around the bidding process is impeccable, they will feel more comfortable giving you the job. Clarity: The customer can review the terms of the agreement and request changes if they need to. Immediately after the e-signature, you and your customer get a signed copy of the agreement. There are no misunderstandings about what was approved and that helps you get started with confidence. Efficiency: No more paper copies being circulated around and no more delays because the paperwork is not signed. Nowadays, everyone has internet connection, either on their phones, at the office or at home. Besides, once the document is signed, you don’t have to worry about storing the paper copy in one of your folders. Knowify automatically stores it in the your Documents section and you can reference it whenever you need to. Many of our users have the really good practice of sending the signed contract along with the invoices when they bill the client. Customers appreciate that. Time savings: By entering the terms of the agreement in Knowify, you are already streamlining the rest of work at the office. You can turn the contract into a plan to track your job or bill your customer knowing that the invoice will reflect the terms of the agreement. This is ideal if you have multiple people in the office involved in the bidding/billing process. Legal coverage: Disputes around jobs are a serious issue. You want to avoid them by all means and having a signed document with the terms of the agreement can be a life saver. In both the US and Canada, e-signatures have the same validity as paper signatures. We would argue that they are even stronger: you have an email trail of the document being sent to the customer and signed back, and we store additional information on our end about this transaction in case you ever need it. We’ve worked with thousands of contractors over the years and the best ones always have a high level of organization around their contracts. Do not wait until it’s too late to get organized. Start today.